A few months ago I discovered a wonderful little creative shop in Denver called Sukle Advertising & Design. They do quite a bit of government-sponsored work, like for water preservation or anti-smoking initiatives. I’m hoping they get a more substantial client soon. They seem to have some nice talent over there — as evidenced by their most recent work for the Wyoming Department of Health. 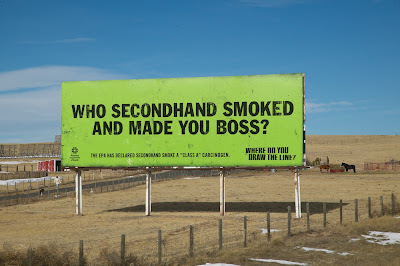 The idea is simple: make the term “secondhand smoke” synonymous with death. Literally. 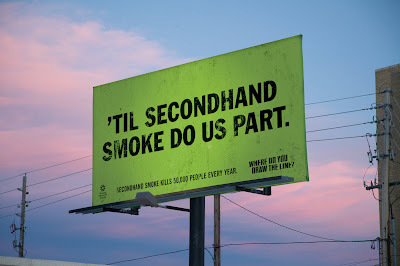 These outdoor boards do just that, replacing the word death or one of its derivatives with the term secondhand smoke in common idioms or phrases. There were several of these, but these two are my favorites. Special kudos to copywriters Jim Glynn and Zac Spector. Sorry to comment off-topic, but I wanted to comment on your article about your clearplay DVD player on "The Back Bench". I couldn't figure out any other way to contact you. I enjoyed your review, good job, glad you're enjoying your clearplay dvd player. We purchased two about 6 months ago, and we LOVE them! I just wanted to comment that ours was really easy to setup (we have a PC). You just plug in the stick to the computer, choose "auto update", and the new filters automatically load. Then you stick it in the DVD player, and when you put in a DVD, the filter automatically loads onto the player. So, I just thought that I'd point out the fact that you may have been a little hard on the setup experience. lol. These billboards are often referred to as "LIME LIES" by Wyoiming folks… lot's of mis-information!